Monday, March 24, 1997, approximately 2 P.M. A cool, sunny day. The postman climbed slowly up the six brick steps with a bundle of letters, circulars and a small package. Little did he suspect that this was a parcel fraught with destiny. The unsuspecting carrier had just dropped a minor mystery into my mailbox – not a major one, but a puzzle that I could not solve at the time, and not in the intervening sixteen years. The dingy little package contained a slim red book. My jaw dropped. The Slim Red Mystery Book. Since about 1957 I have collected a number of obsolete popular cultural printed materials: broadsides, illustrated magazines, dime novels and juvenile series books. Series books were the first, thanks to ‘Buy one, get one free’ offers at bookshops. Soon I discovered that my favorite series books could be had secondhand at a tenth of the price of new copies. I was hooked. My chief purpose in collecting was to read and enjoy the books, and finding elusive titles became a lifelong quest. In the 1980s, to assist my search for these volumes, I began subscribing to various collector fan magazines and corresponding with other collectors and dealers. The principal journals were and are Dime Novel Round-Up, Yellowback Library, the Horatio Alger Society Newsboy, the G.A. 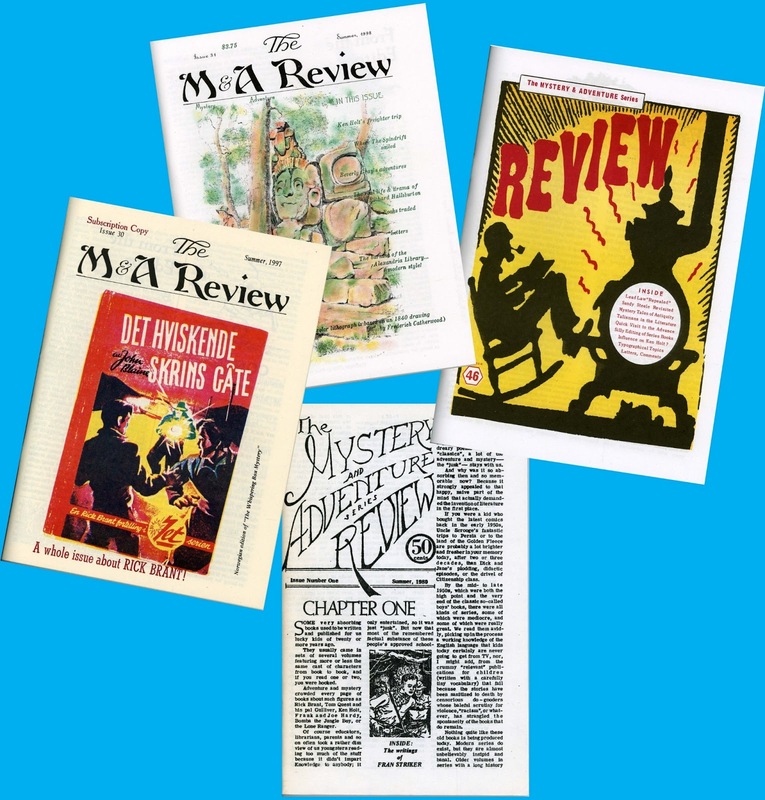 Henty Society Bulletin and an iconoclastic publication called The M&A Review or The Mystery and Adventure Series Review, published at very irregular intervals by Mr. Fred Woodworth of Tucson, Arizona. This last-named journal can arrive anywhere from once to four times in a given year. It is always worth the wait. The magazine is lovingly hand typeset and printed. Articles are intelligent and eclectic, and geared to readers and book lovers, rather than investors. The M&A Review, 1980 - Present. In addition to the M&A Review, he has published a political opinion journal, The Match, since 1969, espousing his personal, highly ethical philosophy. The Deadly Dutchman. Original Grosset & Dunlap edition, 1967, and M&A Review reprint, 1986. Joseph Clemens Gretter (1908-88). 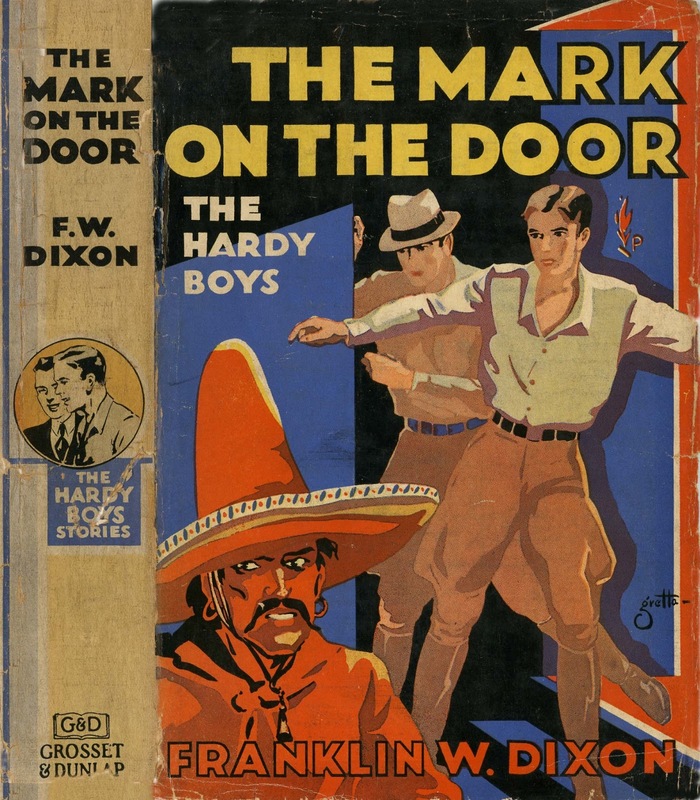 A classic Hardy Boys dust jacket illustration, 1934. Three of the best boys’ adventure series: Rick Brant, Ken Holt and Tom Quest. Grosset & Dunlap published the Rick Brant books in 24 volumes between 1947 and 1968, (23 stories plus the nonfiction Rick Brant’s Science Projects in 1960.) An unpublished 24th story written in 1968 was rescued from oblivion and issued in 1990 as The Magic Talisman, thanks to some dedicated fans. A group of Rick Brant covers, 1947-65. The first sixteen volumes were clothbound books with separate color-lithographed dust jackets. Volumes 1-7 were bound in a smooth brick-red cloth with black lettering. Volumes 8-16 were bound in a rough brownish tweed cloth with black lettering. (Reprints of 1-7 also were bound in tweed.) Numbers 17-23 were published only in full-color lithographed ‘picture covers.’ Reprints of 1-16 had color picture covers taken from the original dust jacket artwork. 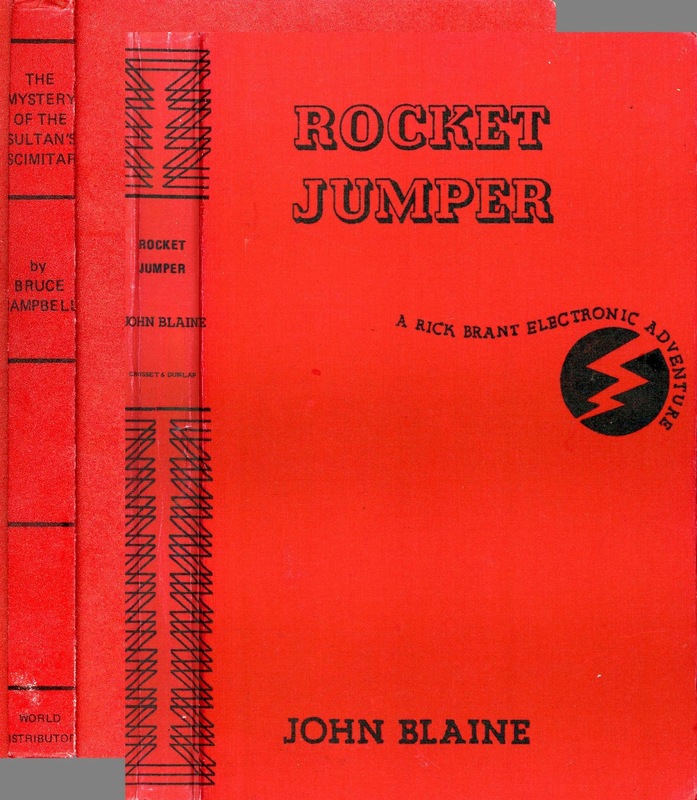 The three Rick Brant series binding formats: red, tweed and pictorial. Rocket Jumper. Original Grosset & Dunlap edition, 1966, and the Mystery Edition. A decade after Fred Woodworth released his reprint of Rick Brant’s chilling encounter with The Deadly Dutchman, my strange package arrived in its smudged envelope with four 32-cent stamps, a book rate sticker and a return address of ‘ACME Book Warehouse/ 24 Ellis/ San Francisco, CA 94102.’ Inside was a series book that was not supposed to exist. 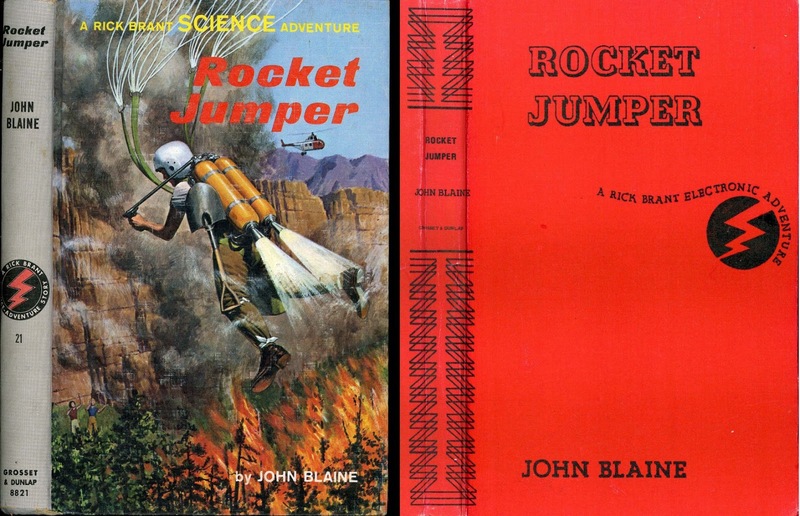 The book that I removed from the San Francisco envelope was a copy of Rick Brant Number 21, Rocket Jumper. Oddly enough I already had a G&D copy in its colorful picture cover. This book looked strange, however. It seemed to be a first format red binding! None of the books after number 17 was supposed to exist in that format, but here it was in three dimensions, with texture, mass, specific gravity and a slightly musty aroma. The thing was real all right. But what was it? 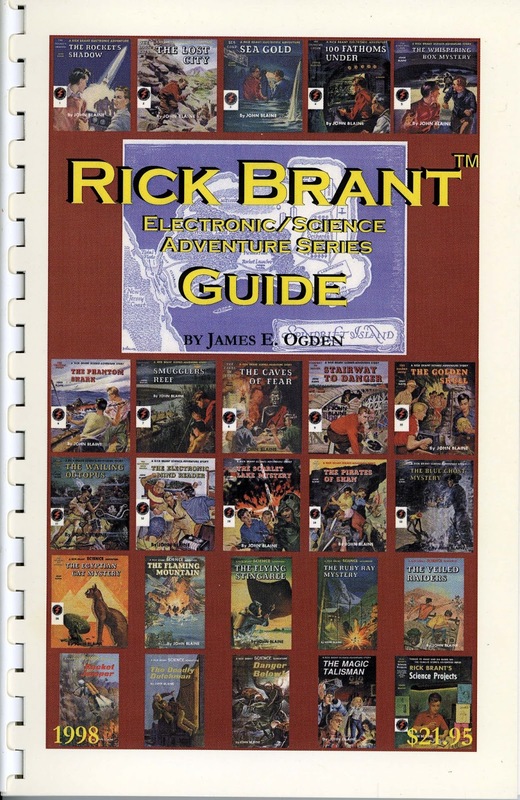 James E. Ogden, Rick Brant Electronic/Science Adventure Series Guide, New Fairfield, CT, 1998. 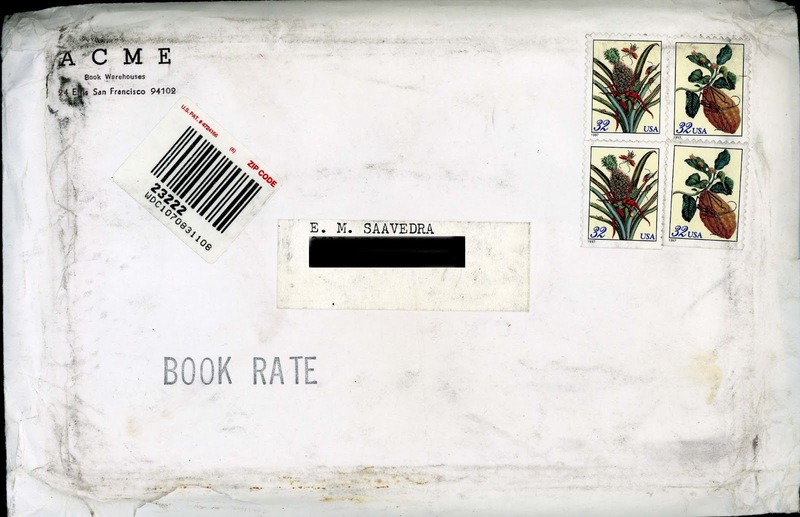 There was no note or invoice in the envelope, just the anomalous book. The next day, I wrote to the ‘Acme Book Warehouse,’ seeking clarification, but my letter was returned a few weeks later as undeliverable. Was the mystery volume a gift, or a shipment destined for someone else that had gone astray? Judging by a flurry of correspondence in the Summer, 1997 issue of M&A Review, others had received similar anonymous packages. Nearly all letter writers assumed that the book was an elaborate hoax perpetrated by Fred Woodworth, but Editor Woodworth denied any involvement. (Although his politics have made him many enemies, his candor has never been questioned.) The mystery deepened. (Perhaps the Acme outfit was a subsidiary of the firm that sold Wile E. Coyote his paraphernalia in the old Road Runner cartoons?) Collector James E. Ogden, who would publish the Rick Brant Electronic/Science Adventure Series Guide a year later, received thirteen copies of the anomalous book, shipped from Austin, Texas. All other mystified recipients reported the nonexistent San Francisco address. 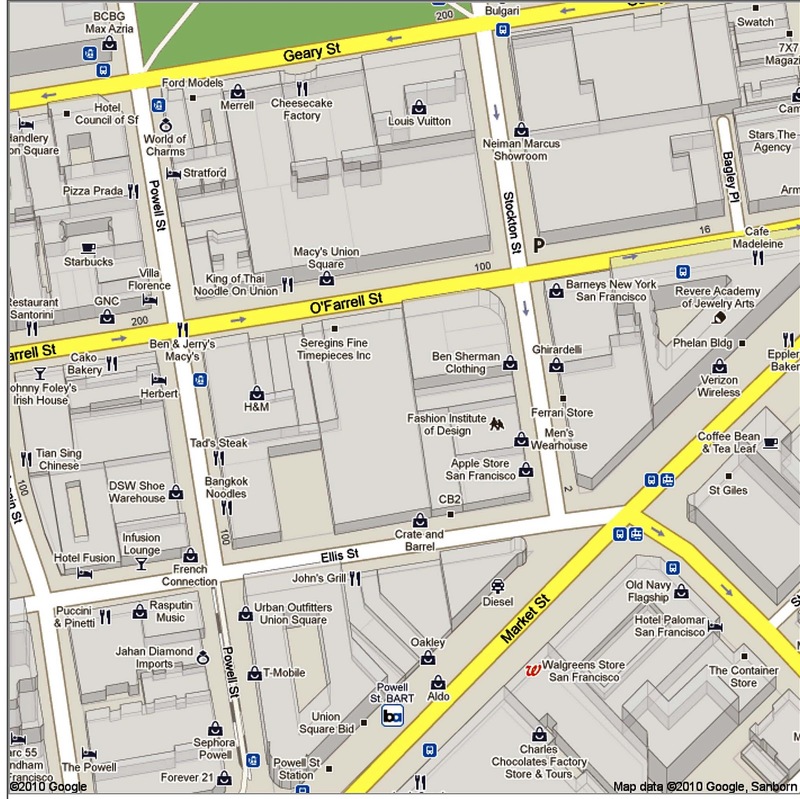 Ellis Street and Vicinity, San Francisco, CA, U.S.A., from Google Maps. By a coincidence, I traveled to San Francisco in Autumn, 1997. Naturally, I found an opportunity to visit ‘No. 24’ Ellis Street. Starting at the corner of Stockton and Ellis Streets, I found an unoccupied ‘Great Western Bank’ and a B.A.R.T. (‘Bay Area Rapid Transit’) Deli, an International Restaurants, and a parking deck. Today, the same block is tenanted by an Apple Store, a ‘Crate and Barrel,’ and a parking deck. Nary a book warehouse in sight. 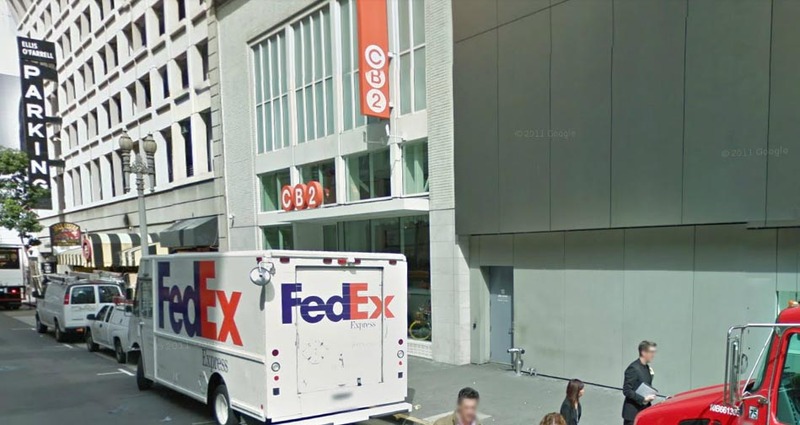 The ‘street view’ option from Google Maps reveals no Number 24, which should be located within the Apple computer store on the right. Ellis Street, San Francisco, CA, from Google Maps Street Views. Every couple of years, I would pull the odd volume off the shelf and examine it for clues. Of the five basic journalistic questions, I had partial answers to What? (A book) When? (1997) and Where? (San Francisco and Texas — or somewhere else.) The Who? and the Why” remained elusive. 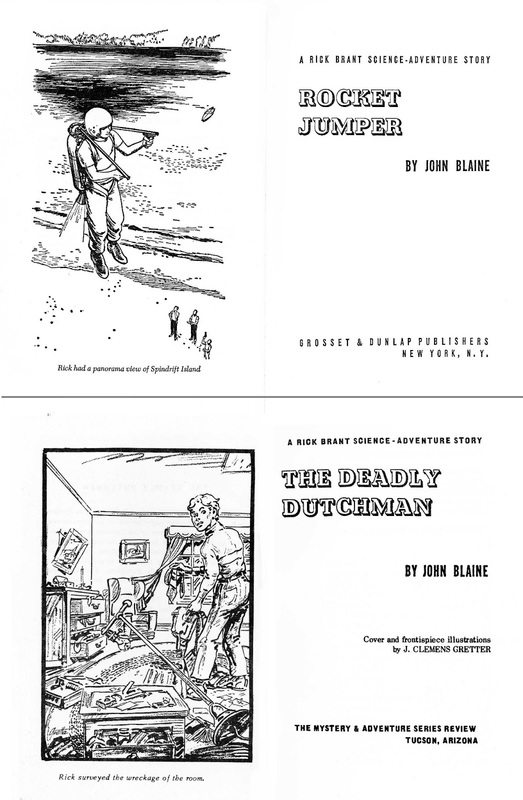 A Comparison between a Grosset & Dunlap title page and that of Fred Woodworth’s reprint. One small clue finally emerged about a year later, however. Because of the same inflated prices that impelled Fred Woodworth to reprint The Deadly Dutchman, I was happy to obtain a U.K. reprint edition (World Distributors, Manchester, Ltd.) of a scarce Ken Holt title to complete my set of that series. (I couldn’t afford the ‘astronomical’ prices for a G&D original quoted by Fred Woodworth’s ‘venal dealers.’) When The Mystery of the Sultan’s Scimitar arrived, I was struck by the resemblance of its binding construction to my Rick Brant book. The spine design was awkwardly proportioned and the book lacked grooved hinges. 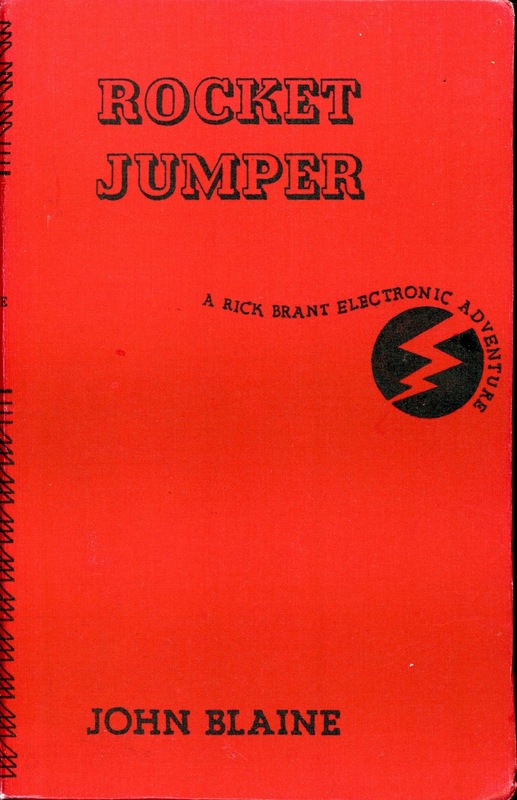 I now suspect that an English distributor obtained a number of unbound G&D copies of Rocket Jumper and fabricated new bindings, using an earlier format as a template. Due to thicker paper stocks used before 1960, the dust-jacketed books needed wider spines. A comparison of a Grosset & Dunlap lettering detail with that of the Mystery Edition. A comparison of binding constructions between a typical U.K. series book reprint and the Mystery Edition, showing the lack of grooved hinges. I would like to thank my benefactor for both a very interesting book and an intriguing mystery. His/ her perplexing book surfaces occasionally on various collectors’ online forums, and fingers still point to Fred Woodworth. A TV detective citing ‘Motive, Means and Opportunity’ would conclude that he ‘fit the frame’ on all three points. Yet, on purely stylistic evidence, I’m reasonably certain that this oddball book is not his work. The printed pages are the unadulterated Grosset & Dunlap mass-produced product. The badly proportioned cover typography and crude assembly fall far below his meticulous design standards. Of course, the person who distributed the books did not necessarily have to be the one who produced them. Lastly, at least a circumstantial connection exists between the mystery book and the Mystery and Adventure Series Review. A majority of the recipients seem to have been subscribers to the magazine and/or purchasers of Fred’s Deadly Dutchman reprint. 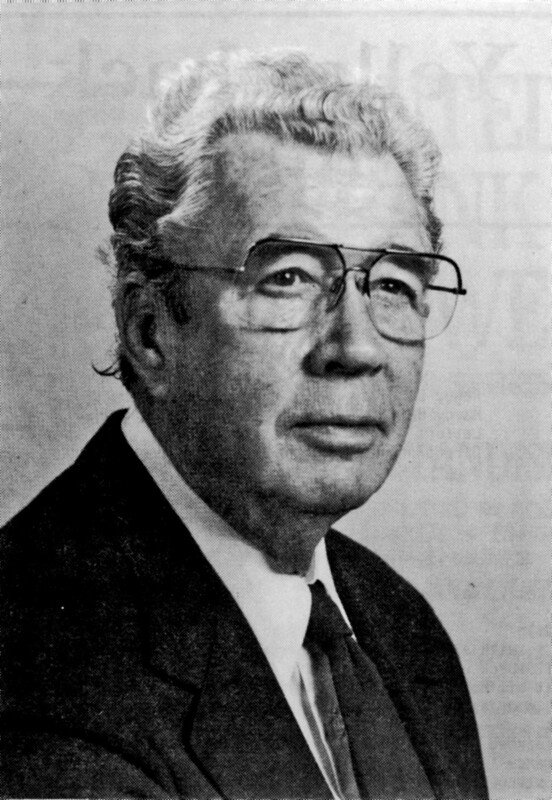 Harold Leland Goodwin, aka John Blaine, 1914-90. WELL, there you have it. The book is as much a conundrum today as it was in 1997. In hopes that this message will reach the anonymous sender: Your unexpected gift was and remains much appreciated. I prize it highly. Unsolved mysteries make the world that much more interesting. Wish I could solve this mystery, but I can't. I just want to add a "me, too" and name Rick Brant as my favorite kids series. In fact, when I sold my collection of boys' adventure books some years ago, the Rick Brants were the ones I couldn't part with. In my youth I read hundreds of boys' adventures, dating back to Burt L. Standish and Victor Appleton the First. Most of them were obviously cranked out without much thought. As a boy and as an adult I was impressed by the quality of Rick Brant's writing. Many of "Blaine's" vivid scenes stayed in my memory my entire life. It was Blaine/Goodwin who taught me the value of "local color" in adventure writing. You felt he'd actually visited the places he described. I got a special thrill when he set a book in the Philippines, where I'd spent a couple of boyhood years. Alas, I never met any pirates. I'm not making Goodwin out to be some kind of genius, but he clearly was a good, caring craftsman who put into each book a little more than he needed to. Wow, very interesting little book mystery! I came upon it today as I sit here "baby-sitting" my one summer school student trying to make up his World Geography course. The last few weeks as we've neared the end of the school year, I've gotten interested in pushing my little Rick Brant series closer to completion. 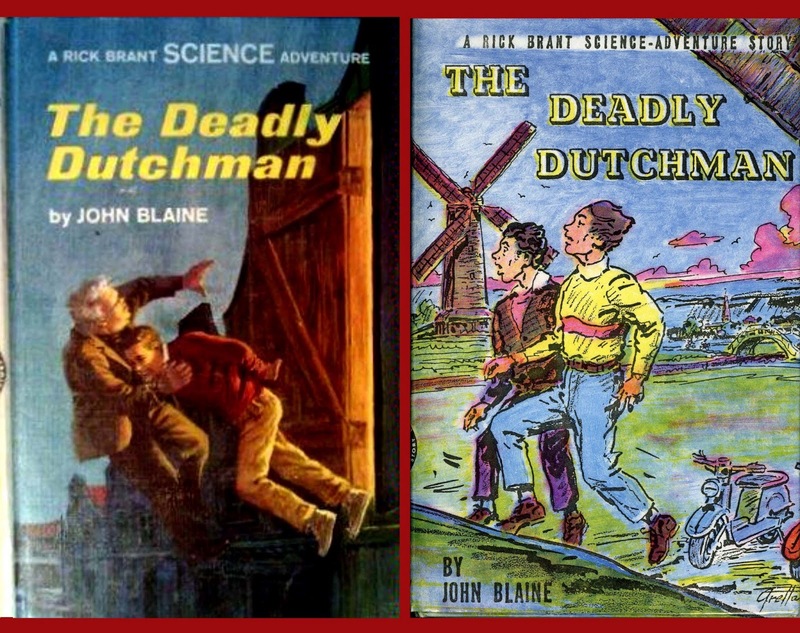 I don't have and have never read the last 5 books, so your story regarding "The Deadly Dutchman" is interesting. I give this series at least partial credit for the development of my fascination with gadgetry! Despite Fred's denials, I believe he's the one who sent the book. I'm basing it on the way he always sent my copies of Mystery and Adventure Review, in white envelopes, using stamps, not meter stickers. I always thought that Fred might have had some aversion to stepping into a Post Office, and was probably mailing his copies from the nearest mailbox. By using a non-existent return address and different font for the anonymous gift book he might have hoped to direct attention away from him. But the act of getting a free copy of such an edition would create a mystery, and he would definitely be a suspect in the commission of such a generous act. Fred is an interesting individual, and sadly I let lapse a correspondence that went for a time a few years ago. Fred was very generous in sharing things with me. My correspondence with him was a few years after he sent out copies of the Rick Brant book, so I didn't get one of those, darn it. I was the recipient of a copy of Danger Below! way back in the 90s. It's not an original, but the stories were and are what's important to me. The first "real" book I ever read by myself was "The Lost City," in 1967, when I was six. Because of that feat, my next oldest sister made it possible for me to get my VERY OWN library card! I still have that library card. 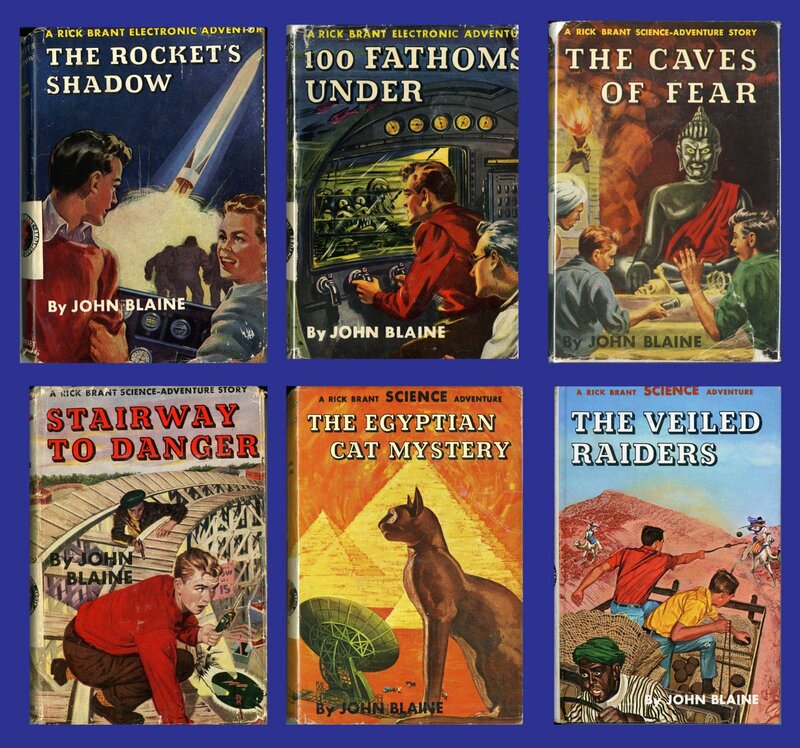 The Rick Brant series (up to and including "The Egyptian Cat") was read over and over through my early teens, lovingly taken care of through the years, and given back to my oldest brother (b. 1947). There will always be a special place in my heart for these well-written books. Thanks for the blog post!